With Derby Day tomorrow and Cinco de Mayo right after that, let’s get you a drink already to begin this cocktail- fueled weekend. Yes, I could. Or a Martini or spring seasonal cocktail of the week, or what not. The finest cocktail I enjoyed in the past week was a masterful “Cocktail à la Louisiane” from Erik Adkins’ extensive Bourbon bar at the new Hard Water along San Francisco’s Embarcadero. So, Bourbon forwards and beet cocktails represent the best of spring’s bounty? Where is the Asparagus Gibson? Three years ago, the area of San Francisco far from the tourist circuit where the more edgy Mission evolves into the looser, residential Potrero Hill was a dining desert until the young, gutsy chef Thomas McNaughton opened the barn-burner of San Francisco’s Cal-Ital restaurants, Flour + Water. His bold cuisine vision and execution was, and remains, nothing short of phenomenal. Hence, the lengthy wait times as long as it takes to walk across this city that still have not lessened three years later. Last year, McNaughton opened a more ambitious, seasonal, local driven restaurant Central Kitchen, and the daytime shop/café Salumeria. The next tenant in the same warehouse building as Central Kitchen and Salumeria has turned the neighborhood and the entire cocktail culture of this fervent cocktail-obsessed city on its side. When Trick Dog opened in February, it was celebrated with cheers, hugs, and kisses almost on par with a Giants World Series parade. Of the world’s most iconic dynamic duos (Batman and Robin, Bonnie and Clyde, Montana to Rice), Josh Harris and Scott Baird have to be the iconic tag team for craft cocktails. In 2009 the pair founded The Bon Vivants, a spirit and cocktail consulting company. If you wanted to throw the best party in the Bay Area, The Bon Vivants had to be there. After years on the parties, festivals, and pop-up circuit, The Bon Vivants finally opened up a bar for everybody. Of course lines are long at prime time like at Flour + Water. That’s part of the deal. The rough around the edges-atelier look of the bar blends effortlessly with the artistic action behind the stick. There are chandeliers. 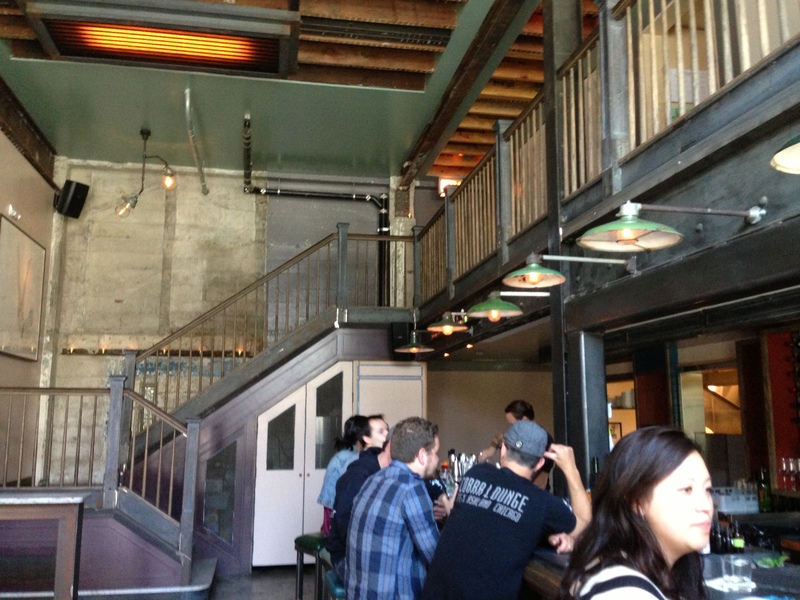 There is also a creaky wooden staircases and no sign outside. Trick Dog’s menu happens to have a few tricks up its sleeves, most notably the city’s now most beloved fanned out menu. 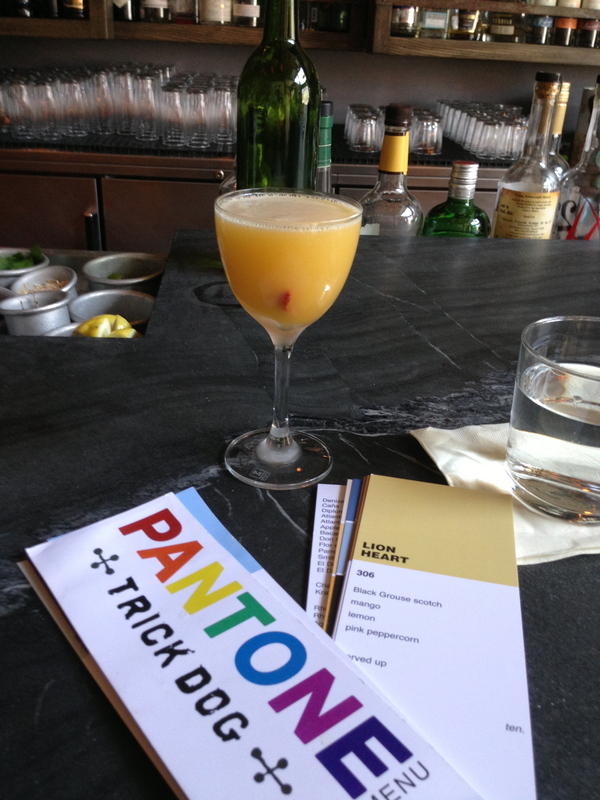 The cocktails follow the Pantone color guide, with each drink’s name either involving a specific feel or color. Think the Manhattan-like “Pennies from Heaven,” the leathery copper hue of pennies, or the Martini meets olive oil in the “Alligator Alley,” with that slightly wrinkly golden tan color you get from spending too much time by the pool in Miami, but wear sunscreen. Cocktail writers and avid fans both love and despise places like this where it will take many long seatings and waits to get through all of the drinks that pique your interest. C’est la vie. It’s popular for a reason. The drinks take some time to complete for a reason. I appreciated the Tiki inspiration in the mango and Scotch paired “Lion Heart,” though it was only refreshing instead of exciting like most of its colleagues. Even a few extra drops of pepper tincture couldn’t add the next dimension found in other drinks. That being said, the freshness and precise balance of smoky Scotch to sweet mango was clearly apparent from the first sip, and you’ll want a bowl of the extra pepper syrup preserved strawberries found at the bottom of the drink as a snack. Campari meets Tequila meets frothy egg whites in the adorable pink hued “Baby Turtle.” I’ve never seen so many men order pink drinks in my life and not even think twice about it. One of the biggest crowd- pleasers is the “Vintage Photo,” effortlessly sending you to the Caribbean via Flor de Caña Rum, Trick Dog Banana Cordial, West Indies Tincture, and bitters, all on the rocks. 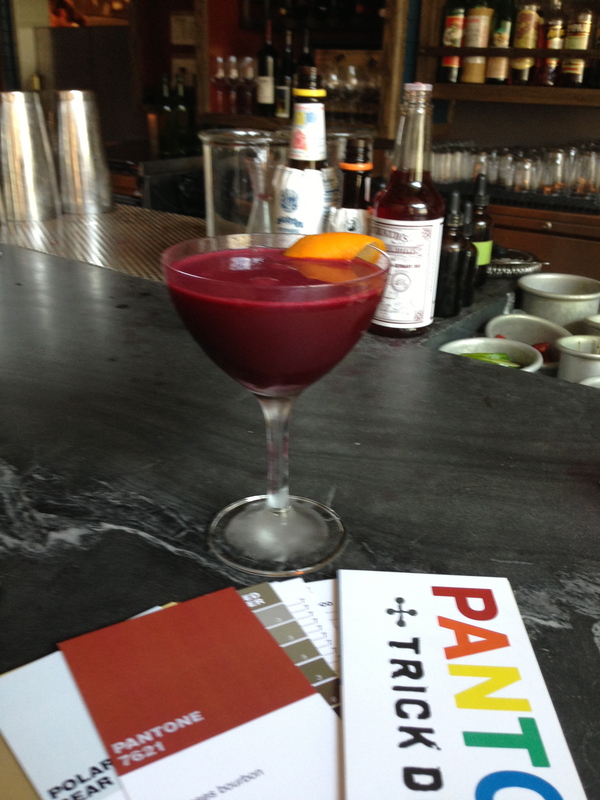 However, the drink of the moment at the bar of the moment involves the namesake for the menu’s color scheme inspiration. And yes, it involves beets. As regal as the most glowing Old-Fashioned and fresh as a San Francisco morning coast when the fog lifts, the “Pantone 7621” is the result of meticulous balance, a serious encyclopedic knowledge of flavor profiles, and sheer artistic creativity. The alluring jasmine color is not in your face violet like you’d imagine. It’s much more a purple tinged rose than vice versa. Served proudly up, quickly it becomes the bar’s attention-grabber away from the aforementioned other pink drink. Raise your hand if you have heard of Kummel? It turns out the caraway seed flavored Scandinavian liqueur is the perfect foil to the sharpness of Four Roses Bourbon, the sweet heat of ginger syrup, and that beloved earthy funk of beet juice. You can end all beet juice-detox comments now. The drink doesn’t taste like beet juice or borscht. It’s startling how everything tames the other. Yet the key, the catch as every spectacular cocktail needs to go to the highest possible level, is that Combier Kummel sliding in as a daring climactic note. What a trick to know. That will be the last beet cocktail highlighted this spring I promise. But please, pardon the terrible pun, you can’t stop this beet. This certainly won’t, however, be the last report from Trick Dog’s bar (or highly-praised kitchen). There is too much important innovation going on to just settle with one Panetone color. 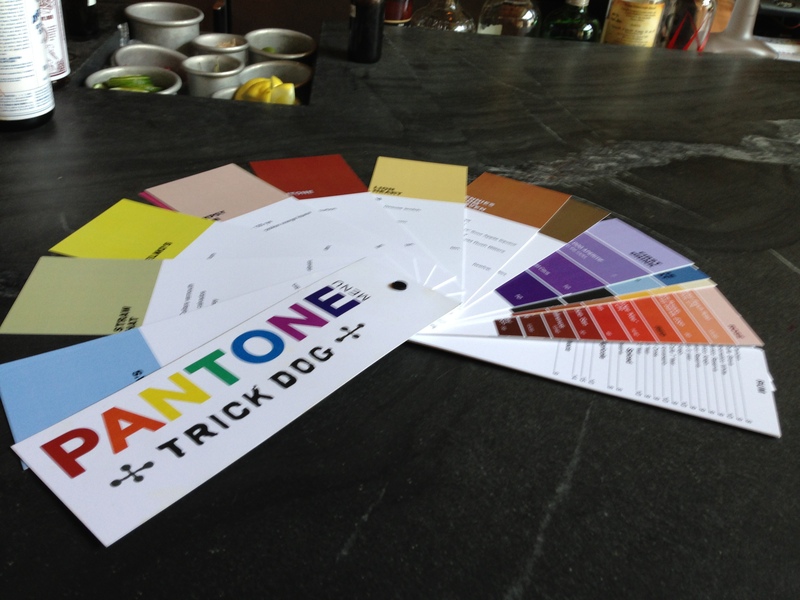 With Trick Dog’s eloquent drinks from the wide range of Panetone colors, you don’t have to stray too far on the Panetone spectrum for the bar’s essential masterpiece. It’s number 7621. Instructions – Combine all ingredients in a cocktail tin, add ice, shake and double strain into a chilled cocktail glass. Garnish with orange zest and peel. *Beet Juice: wash beets and run through a juicer. Strain out any solids. Refrigerate. *** Saline Solution – Dissolve 1 part salt in 10 parts water. Bottle in an eyedropper for easy use. This entry was posted on May 3, 2013 by trevsbistro. It was filed under Cocktail of the Week, San Francisco .